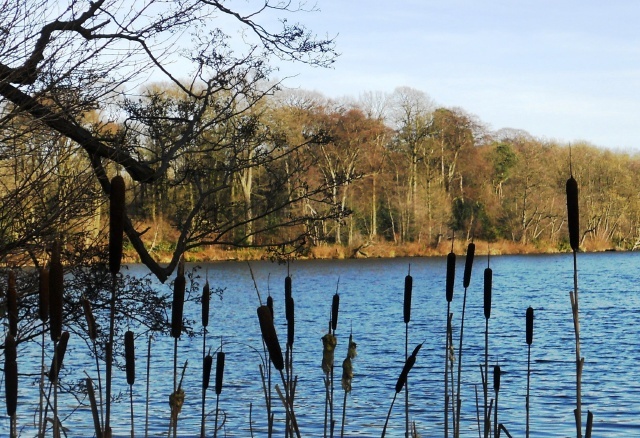 North Shropshire is famous for its "Meres and Mosses" and Colemere is one of the most beautiful of them all. The 1.5km circular walk doesn't have many areas to stop and rest, and during periods of wet weather the path can become muddy in some places, but don't let that put you off. Visitors are rewarded with a waters-edge walk that takes in wonderful meadows and woodland - a must for wildlife enthusiasts! Parking is located at Grid Reference SJ435328. Accessible toilets and refreshments can be found a few miles away at the Ellesmere Boathouse Visitors Centre (Grid Reference SJ405347). Don't forget your binoculars! From Ellesmere, head South on the A528 towards Shrewsbury. After a few miles, look out for the Brown Sign with Colemere Sailing Cluband turn left. Follow the lane towards Colemere village where more Brown Signs direct you towards the car park. Colemere site entrance. There are plenty of parking spaces, although none are designated for disabled visitors. The surfacing in the car park is rather rough and uneven. An information board in the car park provides a map of the circular trail. There are two picnic benches next to the car park. These are accessed over grassland which may, at certain times, be rather muddy. The gaps between the low fencing are wide enough for wheelchair users to pass. Go straight-on, following the line of the hedgerow (on your right hand side) and head towards the kissing gate. The circular walk can be followed in both directions, but most visitors tend to go anti-clockwise around the mere. This kissing-gate has been erected to control the cattle that occasionally graze in Yell Field. The width of the enclosure to the kissing-gate is 1.4m. There is sufficient space for wheelchairs and pushchairs to pass, but mobility vehicles may have limited access. The kissing-gate is operated by either the trombone or the standard latch. The gate only opens in one direction, which some visitors may find llmiting. Follow the worn grass path into Yell Field. There is a minor cross slope here, so some visitors may require assistance. Yell Field is a traditionally managed meadow and is designated as a Site of Special Scientific Interest (SSSI). Grazing encourages a huge range of plant species to grow, including Marsh and Common Spotted Orchids, Yellow Rattle, Meadow Cranesbill and Lady's Smock. A more direct, yet muddier, route to the gate (as seen in the background) is on the grass path on the right. However, bear left and follow the edge of the Mere towards the more accessible boardwalk. The approach to the boardwalk is over uneven ground with a cross slope, so some visitors may appreciate light assistance. However, the ground is rarely muddy and is well compacted. There is a 2.5cm step level rise from the ground on to the boardwalk. The boardwalk is 1.1 metres wide and is edged with timber. The decking is surfaced with metal wire to help provide a better grip. A passing place has been provided approximately half way along the length boardwalk. There are glorious, open views across the Mere from here. There are three gates into Yell Wood. The wicket gate seen here is the most accessible as it is fitted with a trombone latch. The wicket gate opens in one-direction only. The entrance into Yell Wood is rather narrow as the distance between the two posts, seen here, is 1 metre. Most users of wheelchairs, pushchairs and mobility vehicles should be able to pass unhindered. There is also slight uphill gradient, as seen in the background. Yell Wood contains many species of broadleaf trees, including Oak, Beech, Hazel and Rowan. The path is well-laid and level. However, the accumulation of leaf litter has created a few muddy areas, although these are relatively minor. Informal perches and seating areas can be found in Yell Wood. Scattered logs provide a valuable habitat for wildlife, as well as offering visitors somewhere to sit and rest. The path begins to head North and follow the line of the Shropshire Union Canal which is just above the bank in the background. At this point, bear left and keep to the main path. The steps, as seen in the background, lead up onto the towpath of the Shropshire Union Canal. The path is well-defined through this section of woodland as the edging boards are clearly visible. The path width is 1.6 metres. Informal perches are found next to the path, although these are rarther low and can only be accessed over rough ground. The path meanders through the woodland. There are some undulations through the woodland, although far from being restrictive, these add a natural feel to the trail. More informal perches are found throughout the wood. The path enters an area of wet woodland where Alder, as well as Flag Iris and Marsh Marigolds can be found. Sightings of Otter have also been reported in this area! Head straight-on over the bridge and bear left. Magnificent Beeches stand overhead. They may make you feel rather small! View across Colemere, looking West. Some visitors may require light assistance on this part of the trail as there is a slight cross-slope. The path enters another area of woodland with large stands of Rhodedendron. The path widens to approximately 2 metres on a mostly level gradient. There is one, very minor uphill gradient measuring 5%. Another informal rest area at the far side of Colemere. This is set off the main path and accessed over rough ground. View South. The car park is on the far side of the Mere. Yell Wood is on the left of the picture. Go straight-on and follow the track up the slight incline. Turn left here and keep the Mere on your left hand side. A kissing-gate stands at the entrance to Little Mill Field. The kissing-gate does not have a latch. The width of the enclosure is 1.5 metres which should allow most wheelchairs, pushchairs to pass. Users of mobility vehicles may encounter some restriction. The path in Little Mill Field narrows to 1.2 metres. Bull rushes and Yell Wood in the background. As before, the kissing-gate on the other side of Little Mill Field has no latch. The gate only opens into the enclosure (which is slighly narrower than before), making access more difficult. The path now enters Boathouse Wood. From here the path widens again to approximately 1.6 metres. The unsealed path surface is hidden beneath an accumalation of leaf litter. During wet weather this part of the trail may become muddy. 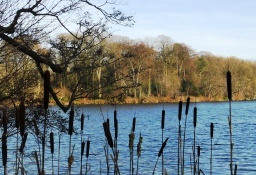 The path follows the edge of Colemere with beautiful views through the trees. Boathouse Wood contains a plantation of Poplar, Norway Spruce and Douglas Fir, along with broadleaf trees such as Holly, Birch and Alder. If you're patient you are likely to encounter some interesting bird life on the mere - Tufted Duck, Grebe and Goosaner to name but a few - so if you have some binoculars, remember to bring them! Lesser Spotted Woodpecker can be seen (if not heard!) in the surrounding woodland. This is the only bench found along the trail and access is over rough ground. Wheelchair, pushchair and mobility vehicle users are unlikely to find that the fieldgate is a barrier. Continue straight-on towards the landing stage. Continue straight-on, following the line of the fence. A slight uphill gradient (5%) leads towards the car park. Follow the path back towards the first-kissing gate. The car park can be seen in the background. Note that the grassland area, although level, is uneven and may be muddy on some occasions. The car park is accessed through breaks in the post and rail fencing. These areas have become rather muddy.